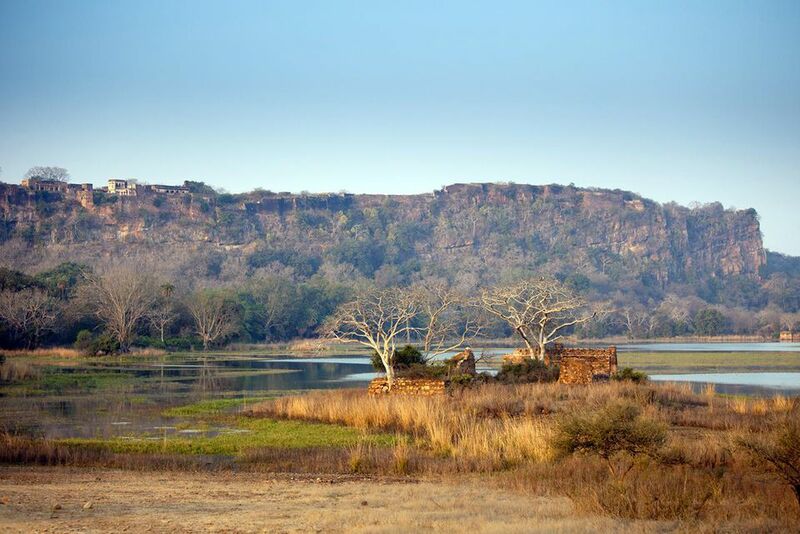 Ranthambore National Park, one of the top tourist destinations in Rajasthan, is a fascinating blend of history and nature. Inside the park is a formidable fort that was built in the 10th century and coveted by many rulers due to its strategic position between north and central India. The park is situated where the Vindhya Plateau and Aravalli Hills join, and is characterized by rocky plains and steep cliffs. It supports a diverse range of flora and fauna, including about 70 tigers. In India’s desert state of Rajasthan, 450 kilometers (280 miles) southwest of Delhi and 185 kilometers (115 miles) from Jaipur. The main gate and fort are a couple of miles inside the park. The closest airport is in Jaipur, four hours traveling time by road. Alternatively, the closest railway station is at Sawai Madhopur, 11 kilometers (7 miles) away. It’s easily reachable by train from Delhi, Jaipur, and Agra. The most animals are seen during the hot months of March through to June, when they come out in search of water. However, it’s more comfortable to visit during the preceding cooler months. Be sure to bring warm clothes if visiting during winter. The park has 10 zones (the tenth one was opened in January 2014 to try and lessen the tourist pressure on the park). Zones 1-5 are in the core area, while the remaining 6-10 are in the surrounding buffer area. Tiger sightings in the buffer zones are usually rarer than in the core zones, although they have improved a lot in recent years as the increasing tiger population has spread out across the zones. So far this year, Zone 6 has been outstanding for sightings. Zone 1 also has good sightings. Zones 1-5 are accessed through the entrance gate near Sherpur village, while zones 6-10 are accessed through gates on the main road south of Sawai Madhopur. Do keep this in mind when booking accommodations. The park is open from sunrise until sunset. Safaris run for two and a half hours from 7 a.m. and again from 2 p.m. The core zones 1-5 close from July 1 to October 1 due to the monsoon rain. However, the buffer zones remain open. The Rajasthan Forest Department offers safari seats in a canter (open-topped truck seating 20) or a gypsy (open-topped jeep seating six). Canter safaris are not available in zones 7-10. Gypsy: 974 rupees per person for Indians.1,714 rupees per person for foreigners. Children under five years old are free. There are discounts for Indian students. Canter: 617 rupees per person for Indians. 1,357 rupees per person for foreigners. This includes vehicle hire and guide fee of 539 rupees in a gypsy, and 422 rupees in a canter, for both Indians and foreigners. It also includes a safari vehicle fee of 134 rupees in a gypsy and 19 rupees in a canter. It's preferable to take a gypsy than a canter -- it's much more comfortable, plus there are fewer people, and the gypsy can navigate better and go faster. Private vehicles are allowed inside the park but are only permitted to go up to Ranthambore Fort and the Ganesh temple. The safaris can be booked online through the Rajasthan government portal. You'll firstly need to sign in or register here. Next, select "Forest and Wildlife" from the options. Then, click on "Rajasthan Wildlife" followed by "Wildlife Ticket Booking". This will take you to the online safari ticket booking page. Refer to this user manual if you need help. As of September 15, 2018, bookings can be made up to a year in advance (previously it was only 90 days) and refunds will be provided within 10 days (as opposed to a month previously). The booking process is rather convoluted though, particularly for foreigners whose cards may not be accepted by the payment gateway (this is commonly the case with Mastercard. Better success is reported using Visa). When booking online you can choose which zone you wish to go on safari in. Unfortunately, seats go very fast in the core zones as hotels and agents make most of the bookings. Alternatively, you can go to the booking office (relocated to Shilpgram from near the Taj Sawai Madhopur Lodge hotel as of October 1, 2017) a couple of hours before the safari starts. This option isn't recommended though. You'll need to be prepared for huge and aggressive crowds. The easiest, although not the most cost effective, way of going on a safari is to let a local travel agent or your hotel take care of the arrangements. This is best if you're a foreigner. Plus, the added advantage is that the jeep will come and pick you up at your hotel. If you book online, you'll have to make your own way to the pick-up point. Hotel Green View is a decent albeit basic budget option that offers safaris. In October 2016, forest officials introduced a tatkal option for last-minute safari bookings. Bookings can be made one day in advance, at the booking office, by paying a higher rate. Around 10-20 jeeps have been set aside for this purpose. The tatkal fee is 10,000 rupees per jeep (seating up to six people). Guests will also have to pay the usual park entry fee, vehicle fee, and guide fee. This is charged per jeep, even if there is less than six people. Nature lovers, who want to remain in the park longer that the standard safaris permit, may be interested in taking an exclusive half-day or full-day safari. This is a new option that was added recently. Bookings must be made in person at the booking office, or through a local travel agent. Only five jeeps are permitted at a time. Be prepared to pay a lot for the privilege. For a full-day safari, the cost is about 65,000 rupees per vehicle for foreigners and 48,000 rupees for Indians. For a half-day safari, the cost is about 37,500 rupees per vehicle for foreigners and 27,000 rupees per vehicle for Indians. In addition to this, the usual entry, vehicle and guide charges are payable. This national park is very popular due to its proximity to Delhi and the fact that tigers are relatively easy to spot here. Traffic into the park is highly regulated the number of vehicles allowed to enter is restricted. Some zones, particularly zones two and three (which have lakes), are better than others for seeing tigers. Zones can only be selected through online booking. Otherwise, forest officials will allocate the zone before your safari. The zone can be changed but only by paying a substantial fee if your request is accepted. Some people complain that there's too much focus on spotting a tiger, with drivers speeding through the park to the places where the tigers are likely to be found, and not enough on other wildlife. Much disturbance is created when numerous jeeps all converge on one area and people shout between vehicles. Your experience will greatly depend on the driver and guide you end up with. Some guides speak English better, and are better trained, than others. Do note that many of the roads inside the park are bumpy and dusty. Early morning safaris are also very cold during winter, so dress accordingly. The fort is interesting, so do take some time to explore it and the Ganesh temple. If you don't have your own vehicle to reach it, vehicles (cars, jeeps and gypsies) can be easily hired from Ranthambore Circle and Sawai Madhopur.